Man your cycling station! - Best Stationary Bikes to burn fat in 2019! Looking for the Best stationary exercise bike for your home in 2019? Our team of experts have handpicked the best exercise bikes and trainer stands that can fit your needs from hundreds of models. Don't buy an exercise bike before reading our unbiased experts review. What Is A Upright Exercise Bike? How To Choose The Best Stationary Exercise Bike In 2019? Does The Bike Have A Noise Problem? Whether you are looking for alternative ways of working out, or you are an outdoor cyclist who is passionate about maintaining the riding shape during bad weather, this guide will help you choose the best exercise bike for your home. When it comes to the best stationary exercise bike, you won’t run out of options. Within the stationary bike category, you might want an upright bike, a recumbent bike, or an indoor cycle. The choice is truly yours, but you have to consider your unique requirements. Unfortunately, making the right choice isn’t easy as you have to spend countless hours to figure out the right exercise bike with thousands of different models and manufacturers, each pitching their own unique selling points. When you look into these options, your head will start spinning sooner than you think. Does that mean you can’t find a stationary bike unless you try a few different models? Fortunately, you are not alone. Many have gone through this journey, and they have done the hard work for you. All you need to do is to be aware of all those decisions and the factors that led to those decisions. You don’t have to reinvent the wheel. So, there is nothing that would keep you away from finding the best exercise bike today. You only need some patience to read through this guide. By the end of it, you will know exactly what you want to buy to address your workout needs. Stationary exercise bikes come in different shapes and models. Based on your position and cycle frame, the stationary exercise bikes are normally divided into three broad categories. We will explore each of these categories in detail below. Upright bikes are the oldest of these indoor exercise machines and they are still popular. Because of their immense popularity, manufacturers introduce new features in every new model. These stationary exercise bikes have some advantages over recumbent counterparts. With the relatively lower price and roughly similar features, upright exercise bikes are a great choice for anyone looking for an indoor cycling machine. These stationary exercise bikes are not only cheaper, but they are also smarter compared to recumbent bikes. They take less space and can be folded and packed easily. So, if you don’t have much room inside but you need an indoor bike, you might prefer upright over recumbent even when the price isn’t an issue. Upright stationary exercise bikes are versatile workout machines. Unlike their counterpart recumbent bikes, they allow you more freedom to vary workout routines. For example, you can stand and pedal, which is not possible when exercising on a recumbent category as you have to remain seated at all the times. If you are looking for a stationary exercise bike that would get you closer to a real outdoor bike, then upright bike should be your choice. Is There Anything Stopping You From Buying An Upright Exercise Bike? The only problem with these bikes is the way their seat is positioned. It’s not comfortable for a long ride. So, mimicking outdoor bike fails if you are planning to spend an hour or so on the bike. If you are an elderly or have back pain, upright bike might turn out to be a bad choice. Some people have also reported that these bikes tend to become unstable when you push them too hard. It means that despite having the freedom to pedal away while in a standing position, it might lead to a dangerously unstable stationary bike. The Exerpeutic Folding Bike comes with a lot of perks that make it our favorite in this category. For example, it has a strong steel frame that can handle a lot of weight. So if you are heavy and you wonder if an indoor stationary bike would support your weight, this bike has the answer. It can hold up to 300 pounds without crunching. Having the ability to hold heavy weight doesn’t mean that the bike itself has to be heavy. It only weighs 39 pounds and it can be folded. Put it under a bed or slide the folded bike in a cupboard. All this is possible with this folding stationary bike. You might just be wondering how much is it going to cost to get such a strong yet lightweight bike. It’s not much. In fact, this is probably the cheapest bike in its category. The Exerpeutic bike offers smooth cycling experience with magnetic tension control system that has eight different tension levels. The bike is also equipped with a powerful crank system. Schwinn is one of the oldest manufacturers in the stationary exercise bike industry. They have used all their knowledge to build the ultimate Schwinn 130 bike. Schwinn 130 Upright Exercise Bike has a strong steel frame that can hold a lot of weight without showing any signs of wear and tear. The moving parts are also made from high-quality steel to ensure stable cycling experience. The bike comes with standard Schwinn console that adds a lot of features to this exercise machine. You can listen to songs, change your phone using the USB ports, monitor your heart rate, and connect to apps to visualize your workout data. SOLE LCB Bike, manufactured by SOLE Fitness, is marketed for commercial use. But since this bike belongs to light the commercial category, it can be used at home as well. The SOLE LCB bike has a heavy flywheel and different levels of resistance. This means you can easily move from one resistance level to another smoothly. The bike comes with heart rate monitoring technology. You can either use the pulse grip or purchase the optional chest strap to monitor your heart rate. That’s not all. This stationary bike also offers additional features to make your exercise time more enjoyable. For example, there is a fully loaded console with features such as music compatibility and charging port. Also, you can also turn the fan on, another interesting feature, if the heat is getting to you. 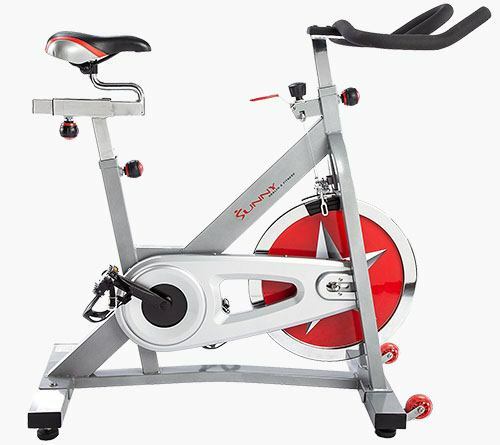 Indoor spin bikes, or indoor cycles, are technically upright bikes. Think of them as the update on traditional stationary upright bikes. But in some ways, they are also a downgrade from their predecessors as they don’t give you a lot of extra features. These bikes are designed to mimic outdoor road cycles. When you are riding one of these cycles, you can’t play games on your iPad or have a phone conversation with your colleague. That’s just the way it is when you are racing down the road on a road cycle. Indoor spin cycle bikes are perfect for anyone looking for the indoor workout as a replacement to the outdoor road cycling. They give you a great cardio workout – one that you expect from road cycling. For many people, indoor cycle bikes are the right choice. Here are the features that make these bikes better than their counterparts, especially when your focus is the intense cardio workout. These bikes come with transmission system and a flywheel, connected to the bike pedals. Due to this structure, these bikes are able to mimic outdoor bikes. To pedal, you will lean forward just the way you do on an outdoor bike. Since you can move the seat and the handlebars, it’s easy to get into a cycling position that resembles your outdoor bike experience. These stationary bikes let you stand and pedal. This feature is often missing in other exercise bikes, making them less appealing for people looking to mimic outdoor road bike with an indoor exercise machine. Customization converts good exercise equipment into a great one. You can customize your bike to the best of your comfort. All the leading manufacturers of this genre offer you highly adjustable bikes. You can shift seat height, handlebars, seats positions, etc. Once you’re comfortable with the equipment, you will work-out happily to reach your fitness goals. The indoor spin bikes also offer various other subtle features that are better left for fitness geeks. One such example is Q-factor, which is the distance between the crank arm and its attachment point. With short Q-factor, these bikes are able to provide a stress-free experience. The Sunny Health & Fitness Pro bike is a low-priced exercise machine for cycling enthusiasts. However, the lower price doesn’t mean lower quality. In fact, this stationary bike has one of the strongest frame, made of pure steel. The stationary bike has a 40-pound flywheel and adjustable resistance levels. You can easily adjust the level to your comfort, without ever worrying about the stability of the cycle. With an adjustable seat, you can easily find the height that’s perfect for you. Additionally, Sunny Health & Fitness Pro lets you adjust the handlebars so that you can control your cycling posture. Lean forward or pull the handle back a little – it’s your choice with this indoor cycle. The Keiser M3 Indoor cycle is a beauty. If you look at the number of people who own this bike, you will know why Keiser is so proud of their product. It’s durable and stays with you for years. Not just that, it gives you excellent workout without giving you fatigue. This stationary bike comes with a magnetic resistance system that offers 24 different levels of resistance. That means you can easily find the resistance level needed for intense workout sessions. You will also get a console with this bike. The console displays your heartbeat rate so that you can keep track of workout intensity. You will get a standard chest strap for heartbeat rate monitor. When you buy this bike, you don’t have to worry about the adjustability. You can move the seat in four different ways. The handlebar is also adjustable, allowing you ultimate freedom to find the posture that comforts you. If you are rather looking for something more comfortable and maybe less intense, then read about recumbent exercise bikes below. They could be your choice if you have skipped recommended bikes so far. If you are one of those people who prefer comfort even when working out, then recumbent exercise bike is something to consider. These bikes provide excellent support to your back and the seat position is reclined so that you never feel stress while exercising. Recumbent bikes have a definite advantage over their counterpart machines when it comes to comfort. But that’s not the only advantage to consider when making the decision to buy a bike for workout. The position of the seat is comfortable. So, you can spend hours cycling without ever getting tired. Your hands will be free when exercising on these bikes. It leaves you with a lot of options such as reading books or playing games while working out. Sitting in a reclined position means your free hands will be in a more natural position. You won’t have to lean forward to place your hands somewhere as is the case with the upright bikes. As a result, you don’t get sore hands or tired arms. Despite the additional comfort, you burn the same number of calories during a workout session as compared to traditional upright bikes. You can actually plan longer workout routines with these bikes without worrying about back pain. As a result, you will end up burning more calories compared to upright bikes. These bikes have a low center of gravity due to their unique seat position. The rider and the bike remain stable at all the times, even when pedaling at high speeds. Are There Any Downsides Of Recumbent Fitness Bikes? The only downsides of these bikes are price and lack of cardio workout. So, unless you want to use a bike for cardio routines or you are tight on budget, a recumbent bike will prove to be a better choice. You will be spending more time on your bike. As a result, you will get in shape faster compared to when using an upright bike. Many people want a recumbent bike for indoor bike workout but they don’t look into this category because they think it costs a lot more compared to uprights. To some extent that’s true. But Exerpeutic 900XL bike is here to prove this notion wrong with an unbelievable price tag. Being really cheap means that you will have to live without the bells and whistles that you see in most other bikes. For example, you won’t get a fancy console that can connect to your fitness app to track your progress is respect to pre-set fitness goals. Despite lacking features, this bike still offers heartbeat monitor that allows you to see your heartbeat rate. The low price hasn’t barred Exerpeutic from building a bike that can support as much weight as much its high-end competitors. The bike can hold up to 300 pounds. The bike comes with an adjustable seat and large pedals that make it easy to enjoy longer workout sessions without stress and fatigue. Nautilus R616 Recumbent is loaded with features. Still, you don’t pay as much as these features would cost. That’s the reason R616 is one of our favorite machines in this category. The bike offers 25 different levels of resistance. So, if you are looking for a recumbent that gives you total control over workout intensity, look no further than Nautilus. When you buy Nautilus R616 recumbent bike, you are buying a lifestyle. This bike comes with a lavish console. You can connect your iPad and send heart rate and other data to your apps so that you can analyze it the way you want. Additionally, there is a media shelf and a cooling fan with speed control. The bike has 29 different workout routines. All these workout programs are installed into the console so all you have to do is select a routine that you want for today’s workout. These workouts have 9 different heartbeat categories, each designed by a fitness guru. Stationary exercise bikes with higher cost provide more features as compared to bargain-priced machines but that doesn’t mean that cheaper machines won’t flex your muscles. They can give you a good workout especially when you make a smart purchase. Features that helped others make the right decision could also inspire you. Read through these features, and you will be able to narrow down your options, starting with what features you need in an exercise bike. When considering different options, you have to think about the warranty that you are getting with the stationary bike. Usually, people insist on 2-3-year warranty for bike parts. Some manufacturers also include one-year free labor. Some bikes come with a simple display that makes the bike easy-to-use while others have complicated display panel that requires learning. Nearly all the exercise bikes display heart rate, speed, and RPM while some also add the number of calories you've burned during a workout session and other interesting stats that could help you track your progress on the machine. All the latest machines are programmable, which means you can easily adjust routines and do the workout according to your fitness levels, age, and weight. Resistance is an important factor when you want to achieve your workout related goals. Many top brands are offering the best stationary exercise bike with resistance control. You can easily change the resistance level to adjust to your new workout routine. Some stationary bikes come with an electronic resistance level while others have a lever that helps you adjust resistance level according to the workout routine. Another important consideration is the weight limit for the stationary exercise bike. You don’t want to buy a stationary bike that would not be able to hold your weight as the damage will occur rapidly, rendering your investment useless within a few weeks of use. Moreover, the weight of the stationary bike determines how stable it would be. If the weight is on the lower side, then the bike will become unstable as you pedal fast. Stationary Bikes that weigh more prove to be more stable. However, be sure to check that the bike you prefer has wheels included so that you can easily move it around. You won’t be able to carry a bike that weigh 3 times more than your body weight. Some bikes produce more noise while others are quieter. Although this might not be a major concern for many, it could be an important deciding factor for some. If you are buying online, you won’t be able to test noise levels. So, your only option is to read a review and check resistance rating. Moreover, if the stationary bike has fans, it will be noisier compared to bikes without fans. If you listen to music while working out, noise could be an important consideration for you. Safety, although not a major concern when buying the best stationary exercise bike, is still something you should consider before you make a decision. Since the stationary exercise bikes have moving parts, you have to be careful when you have kids at home. You don’t want to buy a stationary exercise bike with an uncovered chain as kids could get themselves injured easily. The best solution would be to insist on buying bikes with enclosed mechanics where the chain and other moving parts are covered properly. Although these features will help make the decision, it’s important that you try before you buy. The best stationary exercise bike for you might have different size and shape compared to what someone else chose based on his physical appearance. Put your feet on the pedals and see if you are comfortable while pedaling the bike. Although you find many our favorite bikes under each category, your options aren’t limited to these. You can do your research and find many other bikes that will prove a viable option. However, you have to be sure to keep the following in mind while buying the best exercise bike for your home gym. Always go in the market, online or offline, after doing research on how different types of bikes offer different set of features and control over the workout intensity. Thankfully, this guide had all the research that you’d need. If you missed anything, go back and read it all again before buying a bike. Never settle for low-quality bike. These machines have moving parts and you might get into trouble if you are desperately trying to buy a very cheap bike. The bikes included in this guide are all high-quality bikes that give you maximum level of comfort with durability and reliability. Just like the speed gears in an outdoor bike, your indoor bike must have the ability to change difficulty level. Resistance is important to give yourself a tougher or easier workout. You must select a bike that is highly adjustable during a workout to vary the intensity. Good indoor bikes come with a nice touch that let you keep your water bottle next to you. While exercising, it’s important to intake water to keep yourself well hydrated. So, do look for a bike that gives you water bottle handle feature. Always look for the problems with the bike that you are buying. Features may seem like the place to look but it’s the downside of each category that will prompt the right decision. For example, the big problem with upright bikes is that they make you sit in an upright position. So, if you suffer from severe back pain, you won’t buy these bikes. Make sure you know your goals you set for your fitness regime at the time you buy an exercise bike. Do you want to mimic the outdoor road bike or you want a light workout at home every evening? Are you planning to lose weight using a exercise bike or is your focus entirely on cardio workout using cardio machines? Answering these questions will help you set fitness goals, which in turn will help you make the right buying decision when in the market for the best exercise bike. Always you are providing the best information to clients. Nice job, it’s the best Buying Guide of Stationary bikes. Also included a comparative analysis of various brands of Stationary bikes. I like Exerpeutic Folding Magnetic Bike With Pulse.